First Author’s Institution: Department of Physics & Astronomy Vanderbilt University; Department of Physics Fish University; Department of Physics & Astronomy University of Louisville. So you went observing, and you got a time series of images for precise photometry and you want to plot a light curve. Now what? You need to reduce the data. Where do you start? Right here, with AstroImageJ (AIJ). Fig 1. The AIJ image display. Figure 2 from the paper. 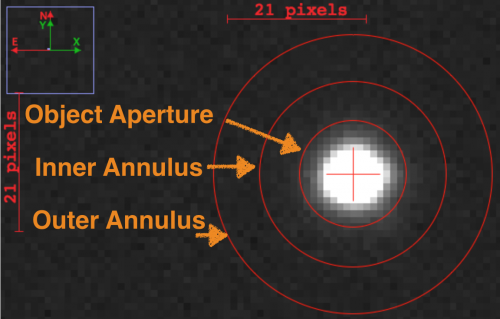 This astrobite is a primer for AIJ: I will introduce AIJ and mention a few things that AIJ can do, focusing on its powerful capabilities for precision differential photometry, and give you some helpful links on where to look for more information. Let’s dive right in. 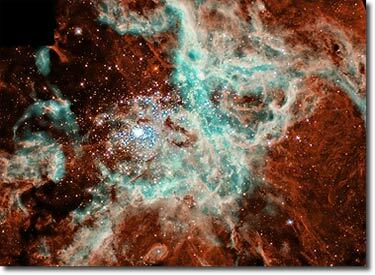 What is AstroImageJ? What can it do? 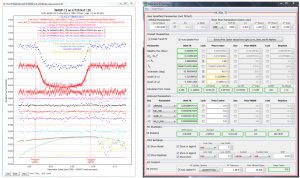 AIJ is an interactive, easy-to-use research-grade image analysis software. AIJ is built on ImageJ, which is used extensively in the field of biology and bioinformatics. The ‘astro’ edition of ImageJ has added to it many astronomy-specific data reduction, analysis, modeling and plotting capabilities. AIJ is built on Java, and runs easily on multiple platforms (e.g., Macs, Windows, and Linux). AIJ does everything a standard FITS viewer and reader would do, and works with other standard image formats as well (JPG, PNG, TIFF, etc.). AIJ is in many ways similar to DS9, familiar to many astronomers (if you haven’t heard of DS9, check out Nathan’s introductory astrobite on it here). Image calibration: AIJ can generate master flat, dark and bias frames. Image arithmetic, including image subtraction, addition, division, multiplication, etc. Stack editing, to easily perform operations on a series of images. Image stabilization and image alignment features. Precise coordinate converters, to calculate Heliocentric and Barycentric Julian Dates. Macro and plugin support: Write your own macros! Multi-aperture photometry with interactive light curve fitting: See discussion below. 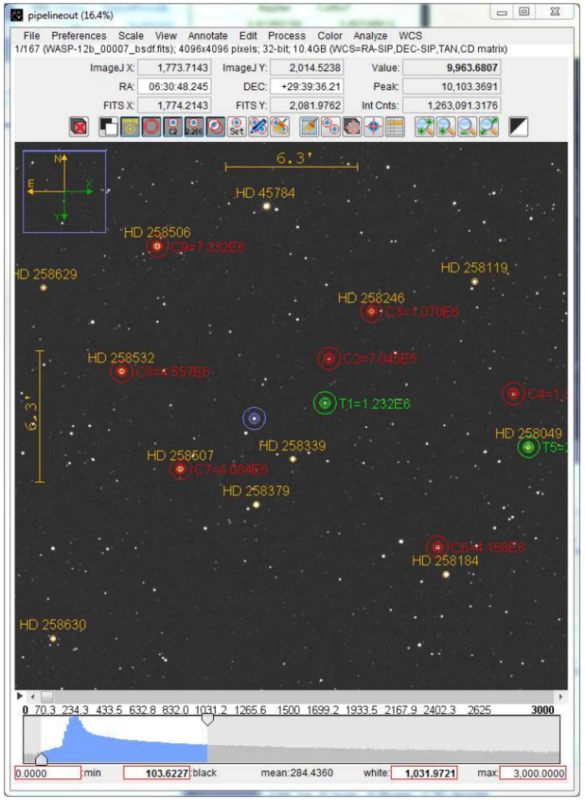 Fig 2: A software aperture in AIJ, centered on a star, with an annulus to estimate the sky background counts. AIJ provides a simple-to-use interactive interface—called ‘The Data Processor’—to perform aperture differential photometry, a commonly used technique to measure the change in the flux from a star, and a technique used to characterize exoplanets via the transit method. The flux of your object of interest—i.e. of your ‘target star’—is represented by the net integrated counts that fall within a user-defined software aperture (see Fig 2). The net count is calculated by summing all of the pixel values within your aperture after subtracting an estimate of the background sky flux, estimated from an annulus centered around the aperture (Fig. 2). The ‘differential’ part comes from the fact that you compare your ‘target’ flux to a simultaneously-observed nearby ‘reference star’ (or an ensemble of reference stars), particularly useful for correcting atmospheric variations (maybe a cloud rolled by?) if you are observing from the ground. Fig 3: (Left) Example of AIJ’s light-curve plotting capabilities. (Right) AIJ transit fitting panel. Figures 7, and 8 from the paper, respectively. 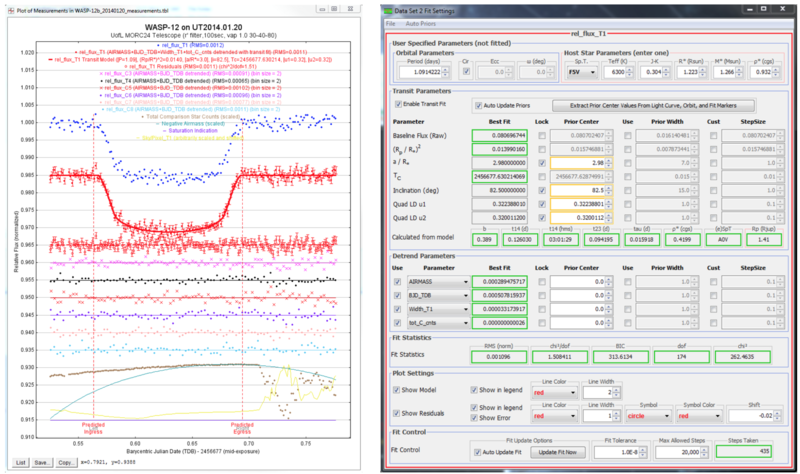 AIJ’s Data Processor module allows you to define your software apertures, and to automatically step through a time series of images to compile and plot light-curves of your target star (see Fig 3, left for an example). 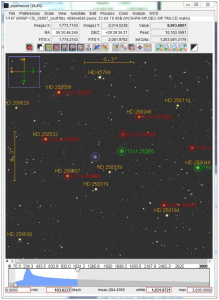 AIJ offers the option to do this in real time, plotting in a new data-point as soon as a new image in your sequence is saved—extremely useful for quick analysis and sanity checking your data at the telescope! If you are looking for planets via the transit method AIJ also offers an interactive fitting tool to fit and detrend your transit (Fig 3, right).